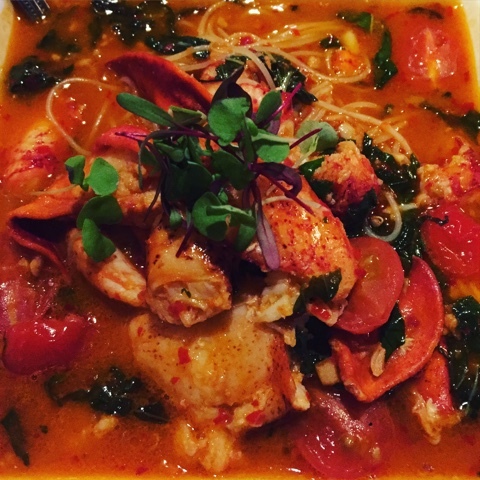 Last year, I gave a mini-review of Liberty Tavern, the Arlington, VA flagship restaurant of two brothers who hail from Binghamton - the Fedorchaks. Last week, I was back in Arlington for work, and took some colleagues with me for dinner at Lyon Hall, the brothers' French brasserie/German beer hall. 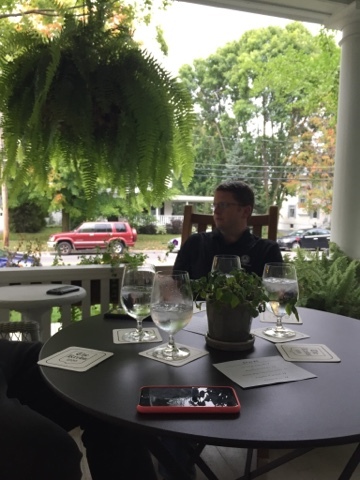 I had an exciting conversation about the meal prior to leaving town with my buddy Dan, from Food and Fire, and was pumped to sample this menu, which features food not found on your typical Upstate NY slate. Lyon Hall, you notice right away, is a very cool spot. It's a fairly cozy space, but very chic - a dark interior with marble floors, close-set tables, and subway tile. Because the tables are so close together, you can smell everything your neighbors are eating, which is a blessing and a curse. The food here smells divine, you guys. No joke. 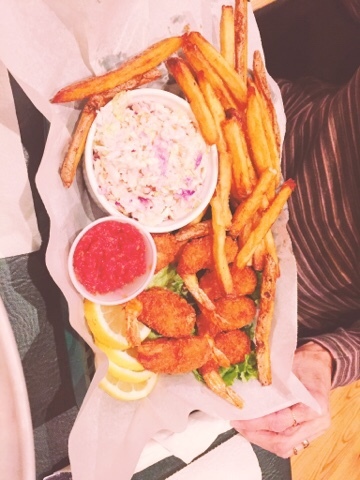 We ordered enough for probably seven or eight people for our four-top, but the mussels and macaroni and cheese on the table next to me where so intoxicating, I briefly flirted with stealing them. One member of our party had scouted the menu prior to arrival, and was jazzed about the butcher's block, so that was our first order of business. The foie gras torchon was my favorite thing on this board, followed closely by a dollop of truffle mustard that was luxurious but not overpowering. The pate was silky and rich, processed just as the gods intended and absolutely wonderful. The pile of prosciutto over in the corner was aged 18 months, and was almost as buttery as duck prosciutto - savory and sweet in almost equal measure, and very tender. 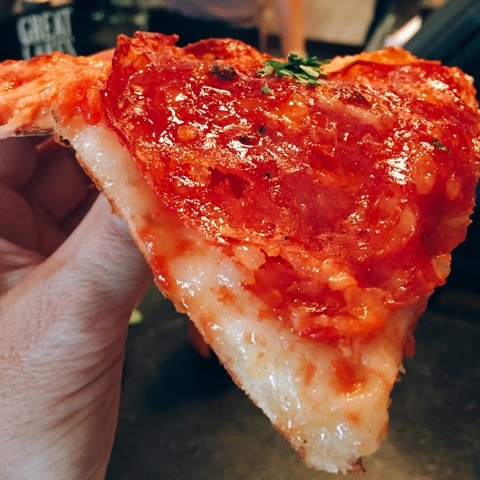 Thin slices of salami were not only sweet from plenty of fennel, but also just a bit spicy, like a very refined pepperoni. A small dish of wild boar rillettes caused the most consternation at our table. Less challenging than it sounds, this was basically pork pot roast covered in a layer of fat. Smear that combo on a crostini and just let the pork fat sing, man. Next up? Pork belly, of course! 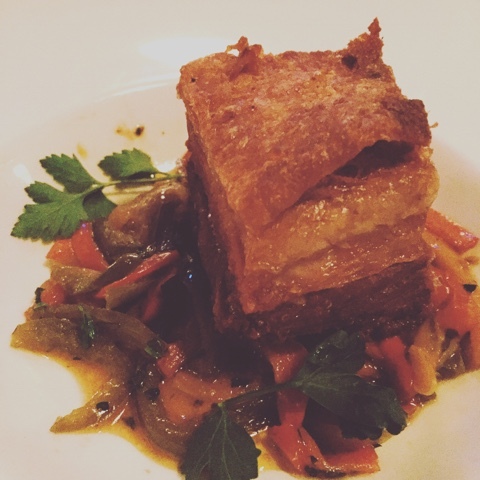 A lot of times, a pork belly appetizer will employ small chunks of meat either braised or fried, but Lyon Hall is not afraid to plunk down a fat cube of the good stuff. 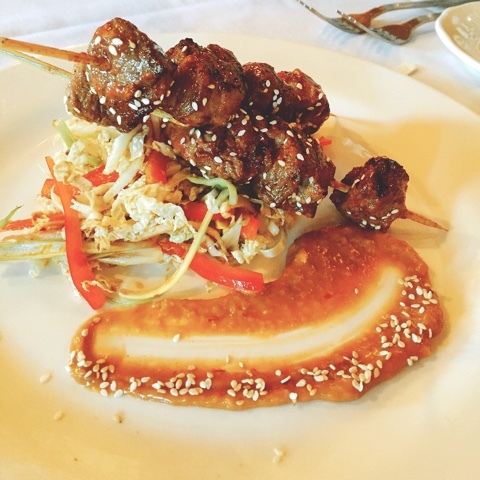 E crispy pork was served over a bell pepper relish with chorizo and basil, the sweetness countering the unctuous richness of the meat. My colleague is a pretty reticent guy, but he actually giggled a tiny bit when he tasted this dish. That's a resounding recommendation, in my book. The Alsatian taste was pure comfort food: onions, bacon, and creamy cheese and herbs on flatbread. It was the most simple dish to hit our table all night, but a welcome flavor break from the richness of all the meat we had just plowed through. 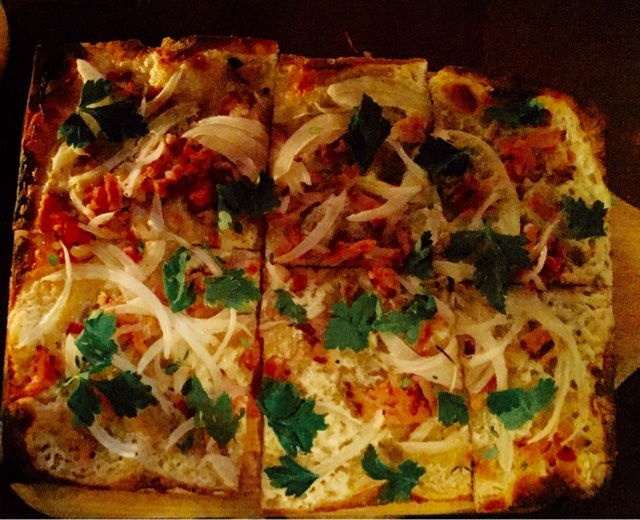 That may sound boring, but this flatbread was far from that. 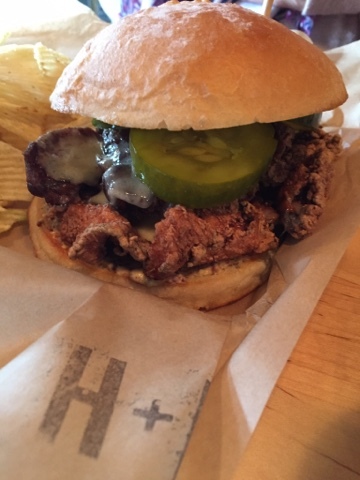 Its familiar flavors, bit of crunch, and herbal cleanness were just a nice break from the meats. On the entree list, the schnitzel called my name. The short rib flirted with me. The sausage platter asked for my number. But I went home with duck cassoulet. The promise of confit duck leg AND smoked trotter sauce with creamy white beans was just too much to bear. 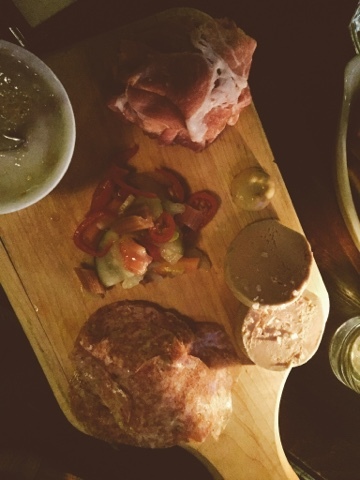 I was impressed when I read that the executive chef of all the Fedorchak brothers' establishments is a Voltaggio alum, and if the skill illustrated in the charcuterie platter hadn't already proven his skill, this dish sealed the deal. The sauce enrobing the crispy breast, tender leg, and beans was incredibly complex, sweet from aromatic vegetables and acidic from long-cooked wine, garlicky and rich and so good I wanted to lick the plate long after I was completely full. The root vegetables still retained some toothsomeness, and the texture of the confit leg was tender and juicy. 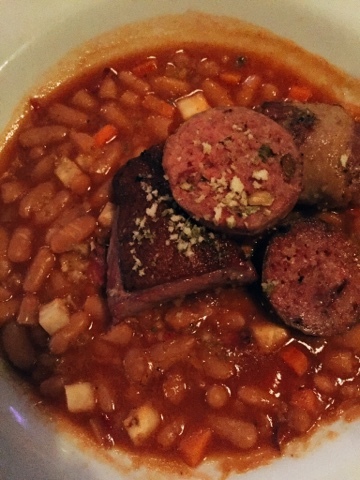 The wonderful sausage was coarsely ground and intensely flavored with garlic, which could have overpowered the duck, but actually worked really well with the beans and vegetables. The breast was just a hair overlooked, unfortunately, but every other component of this was a masterpiece. 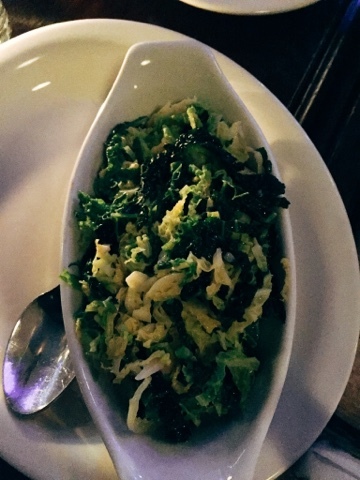 A shared side of barely sautéed Savoy cabbage with herbs and shallots was bright and just barely acidic - a perfect foil for the loads of rich, fatty meats we were luxuriating in. Desserts were less spectacular. 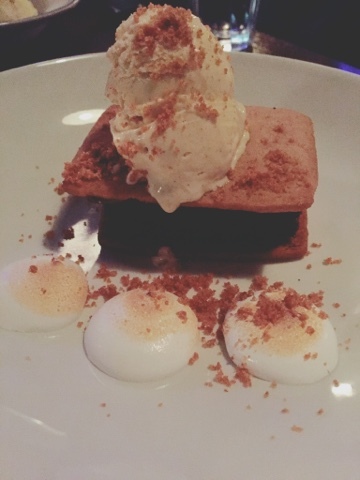 My s'mores napolean was so overpoweringly sweet and rich, I couldn't take more than a couple bites, although the cinnamon ice cream was yummy. The graham cookie component, in particular, seemed tough and too thick for the composition. Overall, though, our feast at Lyon Hall was pretty exhilarating. 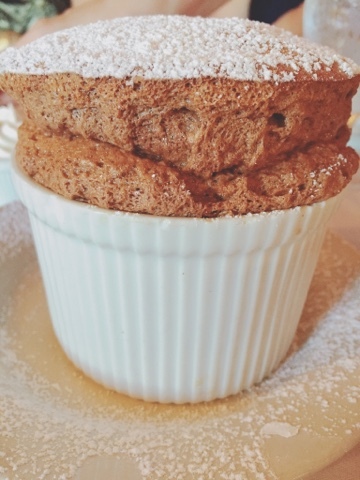 You don't get a lot of brasserie-style food here in the states, and a lot of what we had here reminded me of the better meals I've had in Germany and France, so it's hitting the notes intended. Best of all, knowing this terrific food is being created, in part, by two hometown guys gives me hope that we could support a restaurant like Lyon Hall here in the Soutern Tier someday. I give Lyon Hall a nine on the BHS scale, because after a less pig-out meal, that dessert may not have struck me as so supremely sugary, and while the duck was overlooked, my main dish was aces anyway. My personality is big; my hunger is bigger! At this point, in my late thirties, a post-party, morning-after scavenger hunt for a really amazing breakfast is not something that happens with much frequency. 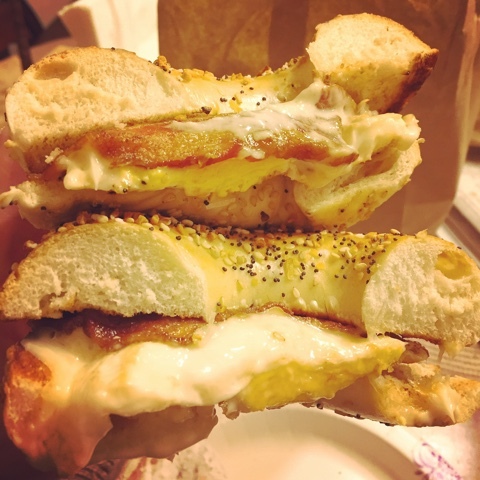 There were many times in the past 20 years that finding the nearest McDonald's for a magical fountain Coke and a McMuffin, or a similar odyssey for the perfect carb-packed breakfast foods seemed as much a survival tactic as a foodie mission. But these days, the level of partying has settled down a bit, and cooler heads usually prevail. But last weekend was an annual Christmas party with good friends, and the after party ended up at the South Side Publick House in Binghamton, which is now occupying the space South Side Yanni's used to inhabit. 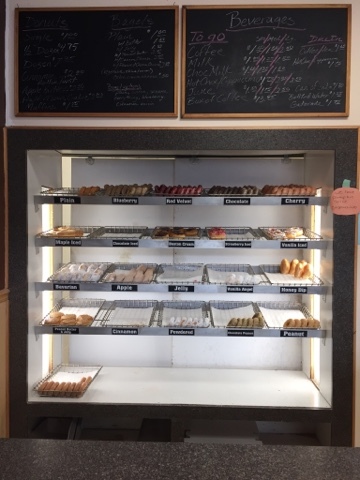 We parked across the street in a small strip mall lot - that strip mall houses Manni's, a little diner that I long have heard makes some of the best donuts in the Southern Tier. We could smell fried dough in the air even at that late hour, and vowed to return in the morning for a taste. Saturday morning dawned bright and chilly, and Big Hungry Melinda and I trekked from her house to Manni's to get our fix. When we walked into the cramped cafe, it was immediately clear that we were not the only locals in the know about the the great donuts at Manni's. The line was to the door, and every seat in the place was full. 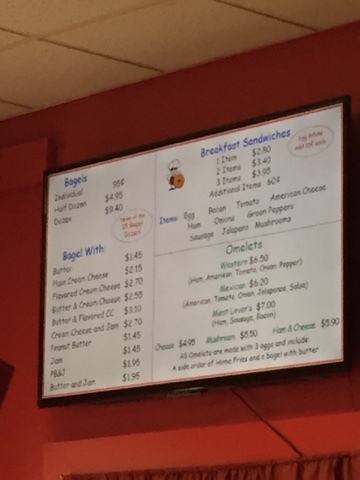 As we waited to get up to the counter intending to augment our donut order with some breakfast sandwiches, we heard one of the waitresses telling a customer that it would be a full half hour for any food orders from the kitchen, they were so backed up. That a good sign that this place is legit, but we were not in the mood to wait around that long. So we quickly adapted our sandwich plans and ordered only a half dozen donuts to go. We next scooted over to Glenwood Ave to complete the rest of our breakfast goals. The Bagel Factory also was busy - a line formed by townies and BU students gearing up for some sort of Santa-themed bar crawl - so we joined the fray. 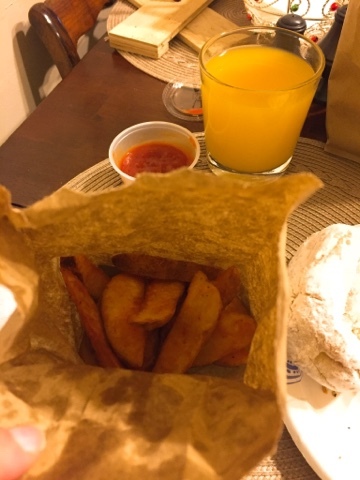 We procured breakfast sandwiches and home fries, and were on our merry way back to Melinda's house. Let's first talk about these donuts, which run the gamut from fruity glazed cherry cake donuts, to filled peanut butter and jelly and boston cream varieties. Did I mention they're made from scratch, in-house? 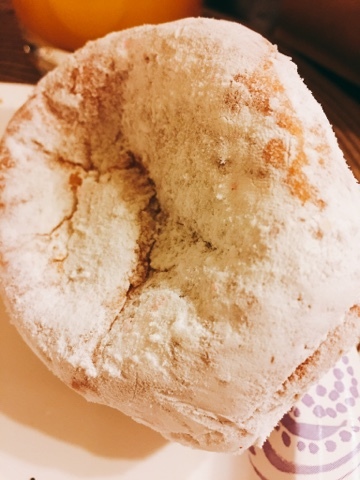 I tried two powdered sugar-covered flavors: bavarian cream and vanilla angel. 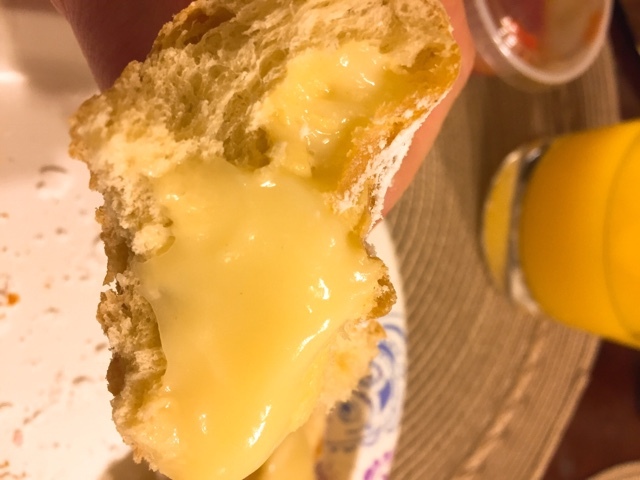 The fried yeast dough was airy but also toothsome enough not to collapse into a ball of sugar the instant you bite into it. 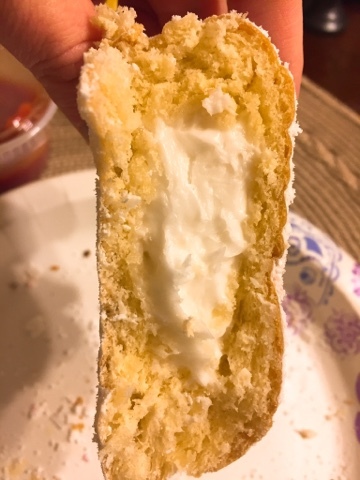 So you had a slight chew giving way to a not-too-sweet, but very light yeast dough, filled with a rich, vanilla pastry cream, and coated in tons of powdered sugar, in the case of the bavarian cream flavor. The vanilla angel donut was crafted from the same dough and sugar coating, but was filled with vanilla buttercream frosting - way too sweet for the likes of me, but for those people who only eat the frosting off pieces of cake would love this sugar bomb. The bagels from The Bagel Factory were pretty great - the crust on the outside didn't have that sheen and slightly harder surface I associate with bagels that have been boiled before they're baked - the truly proper method for making them - but the interior was very chewy, instead of bready, and the seeds and spices on my everything bagel were plentiful and fresh. The American cheese, bacon, and egg, were all flavorful, with the bacon cooked crispy. We plowed through these savory sandwiches with abandon, but not without pauses for the Factory's excellent potato wedge home fries, served with spicy ketchup. 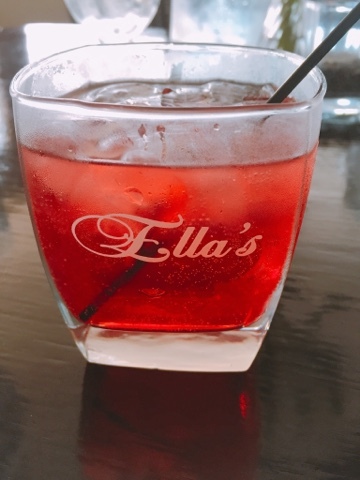 Melinda guessed that this concoction is just ketchup and sriracha sauce mixed together, but good golly, was it delicious on the fried, seasoned taters. It was spicy, but not overwhelmingly so, and the salt level in both this and the bacon, egg and cheese perfectly countered the sweetness from the donuts. This is breakfast heaven, you guys. 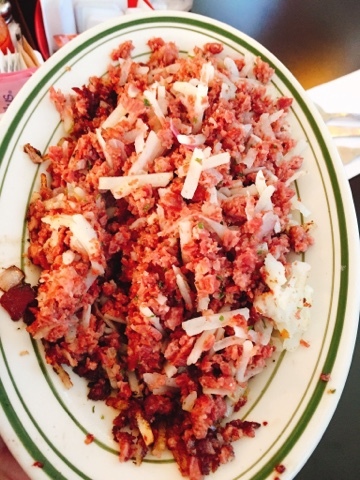 I'm not suggesting that it's imperative that you run all over Binghamton to gather up this epic meal, but a stop at either of these local favorites will fix you up right after a night of partying, or a blissful winter slumber. My personality is big; my hunger is bigger!